John Everard, former British ambassador to North Korea, discusses some of the daunting challenges of reunification as part of an international panel of experts from China, Russia, Mongolia, South Korea, Japan, United States, and Uganda. Policy makers and Korea scholars urge greater civil society engagement, respect for a Korean-led process, and emphasis on the character of a reunified Korean nation. February 28, SEOUL—As global attention was riveted on the second Trump-Kim talks in Hanoi, another more comprehensive and forward-looking summit on peaceful reunification convened in Seoul, marking the 100th anniversary of the March 1 Independence Movement, revered by Koreans as an expression of their shared aspirations to be free and united. The three-day conference explored comprehensive reunification efforts among youth and women’s organizations in Korea and abroad. Sessions on “Transforming Education” advanced significant approaches to ensuring youth will attain the character competencies and skills needed to compete in the twenty-first century workforce. 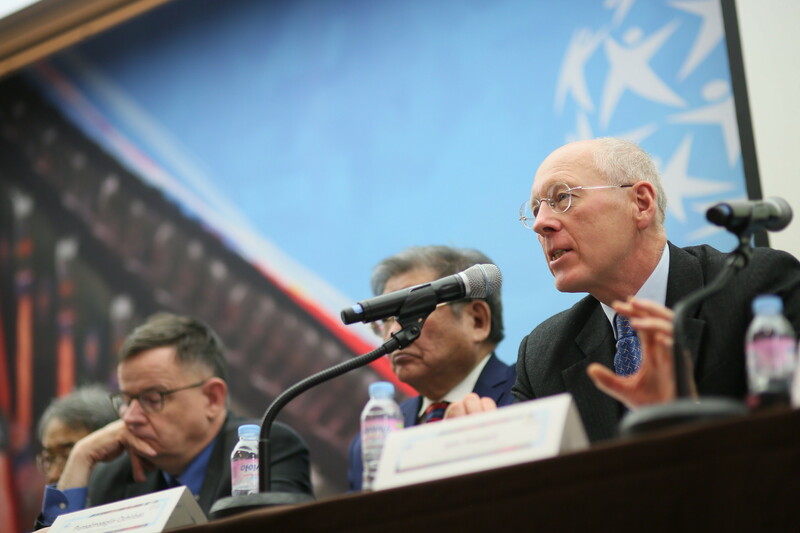 An “International Forum on One Korea” included the diverse voices of Korea experts from China, Russia, Japan, Mongolia, India, Great Britain, and the United States. Additional sessions on “Values-based Peacebuilding” emphasized religious freedom as a fundamental human right and presented a sobering, in-depth accounting of the human rights abuses and violent suppression of religious freedom in North Korea. Realistic assessments of the conflicting interests, alliances, enormous costs, and divergent worldviews of the two Koreas contrasted with other more hopeful perspectives emphasizing the 5,000-year shared history and heritage of the Korean people, the historic opportunity presented by direct talks between the North Korean leader and the U.S. and South Korean presidents, and aspirations of a unified homeland shared by all Koreans. Moon said the March 1 independence leaders wanted more than just freedom from Japanese colonial rule but believed it was their destiny to create an ideal nation that would be an example to the world. The author of Korean Dream: Vision for a Unified Korea (2014), Moon emphasized that the animating ethos of Hongik Ingan could play a profound role in guiding the process and defining the character of a unified Korea. The Global Peace Convention is co-convened by the Global Peace Foundation, Action for Korea United, and One Korea Foundation in partnership with the National Unification Advisory Council of the Republic of Korea.